Research scan: What accessibility features are most useful? Who finds them useful? What conditions make them more or less useful? To answer these questions, we’re reviewing studies that focus on digital or online learning, technology, and disabilities. Market scan: What accessibility features and learning scaffolds already exist on the market, and where? To answer this, we are investigating a wide range of digital learning resources. We began by reviewing 21 open educational resources (OERs) and OER repositories, and 7 EPUB readers. And we interviewed 25 experts from academia, nonprofits and foundations, and industry. We’re on the hunt for research about what features of digital learning tools can best support diverse learners. 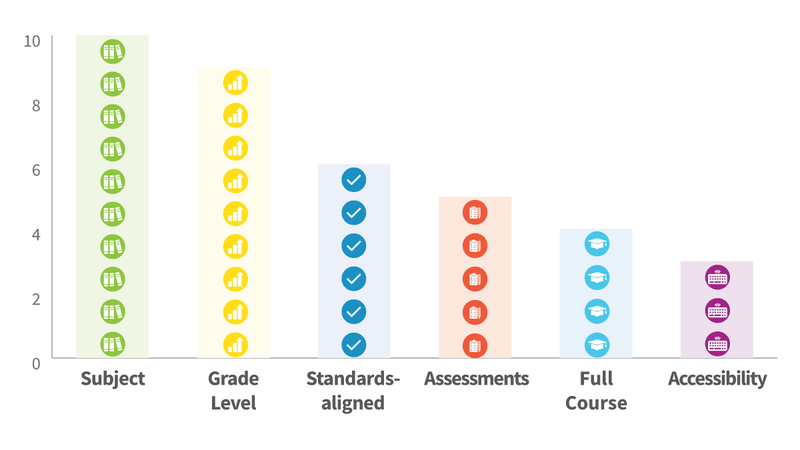 We’re continually reviewing recent studies on digital learning supports. Here’s what we know so far about some common features of digital learning resources. We’ll update this list as we learn more. Line spacing: The literature on line spacing effects is mixed. A study of web text preferences among individuals with dyslexia recommended line spacing of 1.4 and paragraph spacing of 2. Two other studies found that line spacing did not affect readability among individuals with dyslexia. Letter spacing: Extra-large letter spacing (increasing the spacing between letters and, proportionally, between words and lines) improves reading speed and accuracy among children with dyslexia. A study among individuals with dyslexia recommended an increase in letter spacing by 7%. Glossary: In interviews, students with dyslexia said that they remembered or learned more when keywords were bolded or highlighted. Background information: A study found increases in reading comprehension when students with reading difficulties used a system of physical, sensory, and cognitive supports for reading that included on-demand read-aloud features, marking key words or concepts, and providing background knowledge. For more on the role of background supports in a variety of learning contexts, see these additional resources. We wanted to learn how accessible some of the most popular digital learning materials are, so we investigated open educational resources (OERs). OERs are popular all over the world because they’re free educational materials that anyone can share, improve, remix, and redistribute. We searched 10 OER repositories, or databases of free or open source educational materials. This bar chart shows the number of OER repositories that allow users to search by features. The categories are: subject, grade level, standards-aligned, full course, assessments or quizzes, and accessibility features. Longer bars indicate more OER repositories. 10 repositories allowed users to search by subject, and 9 could search by grade level. 6 repositories allowed users to search for standards-aligned resources, 5 for resources including assessments and quizzes, and 4 allowed for full courses or curricula. 3 repositories allowed users to search for accessibility features. We explored whether 10 OER repositories allowed users to search for specific features, such as standards alignment and accessibility. Only 3 repositories allowed users to search for accessibility features. Meanwhile, all 10 repositories allowed users to search by subject, and 9 could search by grade level. 6 repositories allowed users to search for standards-aligned resources (Common Core or Next Generation Science), 5 for resources including assessments and quizzes, and 4 allowed for full courses or curricula.